North of Narrabri: Hitting the "March Deadline". . . Hitting the "March Deadline". . .
Man, that static grass looks great! 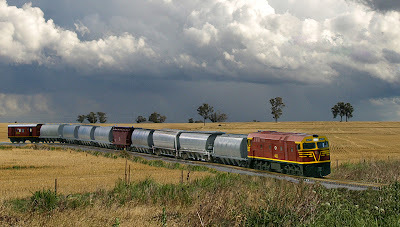 Actually, a Photoshop effort combining a photo of the 442 on a grain train photographed on the new lower level with a landscape photo from the North-West gleaned from on-line. Not quite up to the Ray Pilgrim level, but getting closer. . . I'd set the beginning of March as sort of a deadline to have the lower level benchwork and backdrop up, and last night, I finished painting the backdrop. It's been a month since I'd updated this blog; it's been a busy month on the railroad as I pushed to get as much done on it before my son's baseball season starts up. I wanted to get the "unsexy" stuff out of the way: benchwork, backdrop, some of the roadbed. I was able to even put much of the lower-level mainline in place--albeit held down with track nails rather than anything permanent--as I explored track plan options. There's no wiring on the tracks--I've run trains back and forth using a power pack and alligator clips. 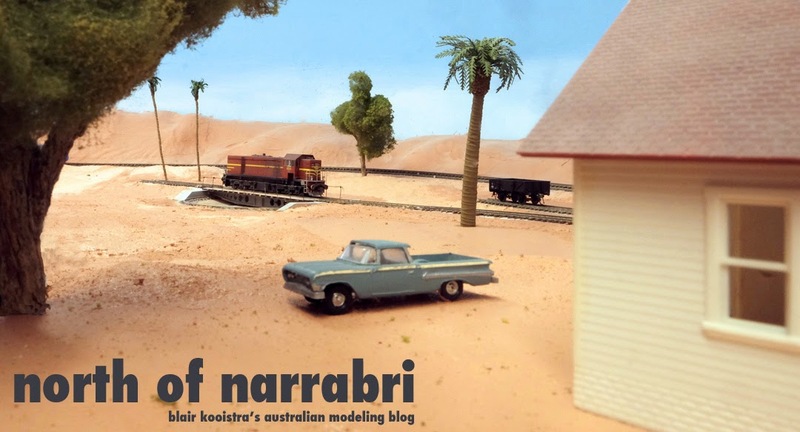 There's only the points at each end of the Edgeroi and Gurley loops, and I've got what seems like a kazillion #5 points to make to finish the yard at Narrabri West as well as the lower level points to access elevators and goods sidings. I did get the lower level lighting purchased and in place, and the benchwork, lighting valance, and roadbed for the branchline terminal at Wee Waa is in place and, in fact, connected with a section of track to the "rest" of the layout. the CVP Easy DCC is still in the box, awaiting installation. But, now I don't feel so bad slacking off for the next couple of months while the kids play baseball, I get the taxes done, get a jump on yardwork (Spring has sprung: 85 degrees here yesterday!) and, oh, yeah, take a trip to Australia for a couple of weeks in April. Now I've just got to dust the layout--cutting ceiling tiles creates a God-awful mess, even after wetting it down with a spray bottle--and put tools and other items away. In the meantime, here's a couple of photos of the lower-level and a grain train: Jumbo 44203 moves along between Edgeroi and Gurley. I'll present both an "as photographed" view of the layout as it is now, with undulating, bobbing, wobbly temporary trackage, and after running through the Photoshop ringer (top of the entry). Oh yeah--that Jumbo is new to the railroad, too, as I took the feeding frenzy plunge and won one on e-bay; it'll be fun to detail and weather. Next post will look at Edgeroi and Gurley, the prototype track arrangements and the compromises I made to fit them onto the layout while still retaining recognizable elements. A bit more true to what the lower-level looks like at this point: 44203 pulls a train of grain empties out of the siding at Edgeroi. The cut-in chunk of fillwork under the locomotive will at some point become a small pile trestle. Enjoyed looking at your pictures. Stop by my blog sometime. Leave the dips, hollows and wriggles in the track, far more prototypical. Sorry, I didn't comment on your first photo. Now you're pushing me, I think it looks great, a little too sharp for the model part (showing in the ballast) but I haven't put the real pic in the foreground as well. I've thought about it but you beat me there. I got "lazy" with the foreground, what can I say! Actually, the ballast isn't ballast at all. . .I nosed around in Photoshop in the "filters" section and found various textures to fill lasso'ed areas with. Would you believe they have a library of "rock" patterns? Too large for what i need, so I experimented a bit with the "Grain" patterns. It's just some dinkin' around, as it is, so I wasn't expecting "perfection," but it's given me a mood to strive for. I love that edge-of-thunderstorm lighting. . the sharp edges to the highlights--some of my favorite lighting conditions when actually in the field. I'll smooth the roadbed a bit, but not all. . .this is, afterall, the Shirley era! Sounds like at least some of us are getting some modeling done! And nice work with the pictures too, there's a real art in mixing models and real scenery together. With the track undulations, as Ray also mentioned, it certainly adds some character to leave some imperfections in the track, so long as it doesn't affect running qualities. This is an effect I want to try to replicate to some extent as it seems to be very characteristic of country NSW lines. I realised later that you hadn't ballasted the track yet so you must have added the ballast in Photoshop. Painful, I can understand the graininess now and yes, a bit of smoothing would help nicely. Thunderstorm lighting, yes I know why you like that effect. Understanding the Shirley era, you really have got into our history. Hi. 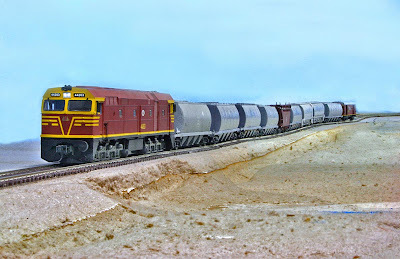 That shot showing 442 class hauling grain wagons is magic. Just discovered your site & am hooked!! !